Jordan Peele’s Us has plenty of freaky moments and unsettling imagery, but the one that’s really stuck in my brain is also one of the simplest. A young girl gets lost in a hall of mirrors… and as she wanders through it, trying to find her way out, she naturally sees her own reflection dozens upon dozens of times. Except once when she turns a corner and sees, not her face staring back at her – but rather the back of her own head, unmistakable with its thick black hair pulled into pigtails. And when she moves, unlike the other reflections, it does not move in tandem with her. Turns out it’s not a reflection at all. If you’ve seen the trailers for the film, it won’t spoil anything for me to tell you that the little girl has in fact encountered, not a reflection, but her own doppelganger. Us centers around a family who suffer a harrowing encounter with another family, one that’s a carbon copy of themselves… except not quite. These counterparts barely talk; their eyes are sunken and wide; they wear their hair differently and are clothed in red jumpsuits. Each one carries a pair of brass, diamond-sharp scissors – and they use said scissors in very unfriendly ways. All in all, the whole thing is much like its predecessor Get Out: imaginative, violent, scary, and full of symbolic overtones just begging to be analyzed. And, like its predecessor, Us sometimes gets too cerebral for its own good, throwing around more ideas than can be adequately addressed in a 2-hour runtime. But there’s an important difference between the two films. Get Out was concerned with a very particular social problem (namely racism), and even a very particular subset of that social problem (namely, the queasy old paradigm of white-versus-black as brains-versus-brawn). The thematic concerns of Us are, by contrast, much broader – and arguably that much scarier. My stomach sort of lurched when I heard that, and I asked myself the same question that probably everyone in the audience was asking – “whoa, what is that supposed to mean? !” After all, these “Americans” hardly fit the picture we like to have of ourselves. They are wrathful, homicidal, almost demonic. But they are also, as we eventually learn, a fiercely tribal underclass (literally – they’ve been living for decades in a network of underground tunnels. Spooky). As in Get Out, Peele is definitely making some kind of socio-political metaphor here. But what it’s supposed to be isn’t as immediately plain – the Tethers don’t fit neatly into an allegorical box as do the baddies in Get Out. Perhaps it’s another statement on black identity? After all, the Wilsons (and obviously their Tethers) are black. But it turns out the white family down the street have their own set of Tethers terrorizing them, so that interpretation seems inapt. Is it a statement on the haves and have-nots? Could be, but the Wilsons seem pretty middle-class – after all, Dad considers it an accomplishment when he gets his hands on a rickety used motorboat in the first act. So they hardly seem like stand-ins for the 1% while the Tethers are the 99%. Perhaps it’s something to do with xenophobia? Again, seems unlikely – the Tethers are overall far too scary and inhuman to be a sympathetic stand-in for the immigrant or refugee. So…who do the Tethers represent? What hot-button issue du jour is Peele using them to illustrate? Well, at the risk of being glib, they are us. Us, U.S., the United States (heheheheh see what he did there?). Obviously this is a very broad category – but that’s precisely the point. Unlike Get Out, which was focused specifically on black/white relations, Us is concerned with a much broader swath of our cultural consciousness. 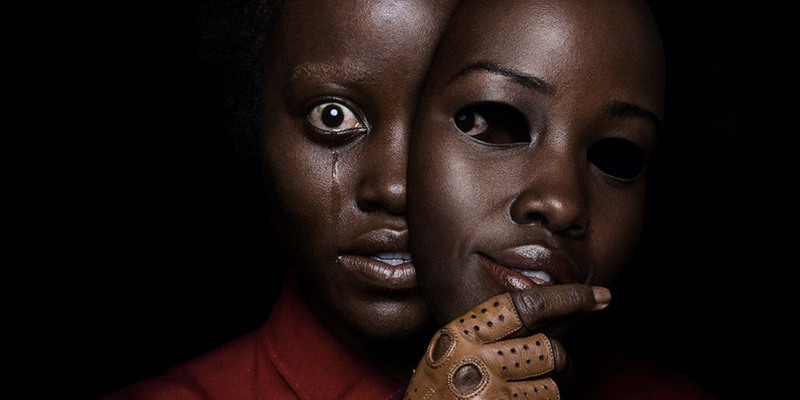 “We are Americans.” Apparently Jordan Peele thinks that’s a pretty scary thing to be. And when I think about how our national identity has evolved over the past decade or so, I’m inclined to agree with him. I vividly remember how angry and upset I felt in the wake of the 2016 presidential election. Not so much because of its outcome, but because of how everyone was responding to that outcome. Suddenly we were all viewing one another as monsters, and more or less behaving like monsters ourselves. According to one side, some unseen horde of neo-Nazis had colluded with Russian spies to overthrow the democratic process; and according to the other side, those deranged liberal snowflakes had pushed things too far and now they would finally get what’s been coming to them (cue evil cackle). The whole spectacle was frightening, maddening, but also darkly hilarious: both sides, while going at each other’s throats, came to very much resemble each other. We found (and still find) ourselves split down the middle as a nation, both halves very much other…and yet inescapably the same. The crazed clones of Us are a more than fitting embodiment of the weird altered reality that had been percolating for years and really roared to life in November 2016. Throughout the film, Peele is always tossing images of symmetry and division back and forth. The ominous Jeremiah 11:11 is a frequent reference; there’s the aforementioned hall of mirrors; and the famous “Hands Across America” campaign of 1986 is evoked by a (literal) red line slashing across the country’s geography. Finally, it’s worth noting again the Tethers’ weapon of choice – scissors. The name “Tethers” refers to the symbiotic connection that these clones have to their counterparts, and they carry scissors as their means of severing that connection. Specifically via, you know, murder. The psychopathic others in Us are not stand-ins for some downtrodden underclass or minority. They’re too inhuman for that. They are us. We Americans are our own worst enemy, dividing and attacking ourselves. Through social media in particular, we’ve come to ensconce ourselves inside bubbles of ever-more-carefully curated groupthink. From inside those bubbles, we see those outside as more and more distorted and monstrous. From inside those bubbles, we get a weird greenhouse effect where our collective identity mutates into something much uglier and simpler than who we really are. Inside those bubbles, we grow into little tribes of monsters. Ever notice how much easier it is to get in a fight on Facebook than it is in person? At the risk of repeating a cliche, ever notice how the “self” that you present online can be subtly (or drastically) different than the self you present in person? “It is so much easier to blame the other,” Peele says. Indeed, and now more so than ever. I don’t know that Us is necessarily the work of unfettered genius that some critics are making it out to be. Again, Peele gets a little trigger-happy at times and doesn’t always know how to corral his many ideas into a cohesive story. But the more I think about it, the more the film’s main conceit strikes me as timely, important, and disturbing. As Francisco Goya famously said (and drew), “the sleep of reason produces monsters.” When we stop looking at ourselves critically, and stop looking at others empathetically – when we stop trying to understand – we turn into a sort of upside-down, monster version of ourselves. Many’s the time I’ve been scrolling through my Facebook feed and found myself suddenly going cross-eyed with anger at the stupid, maddening, d0WnRiGht eViL things I see people doing or saying. And it’s at moments like that when the leering Tether version of me is sneaking up from behind with his brass scissors poised, ready to slice my throat and take my place. But I dunno, maybe that’s just me. Maybe you can’t relate. I kind of doubt it though. James Powers is currently earning his MBA in Film Producing at JPCatholic as a member of the class of 2019. For all articles by James, click here.